Posted on 6, February 2019 by EuropaWire PR Editors | This entry was posted in Awards, Environment, Germany, Society and tagged Audi, Audi Environmental Foundation, Award, Environment, environmental protection, Julia Möbius, Rüdiger Recknagel, Sebastian Heinz, sustainability, Sustainable Resource Management, Technical University of Munich. Bookmark the permalink. 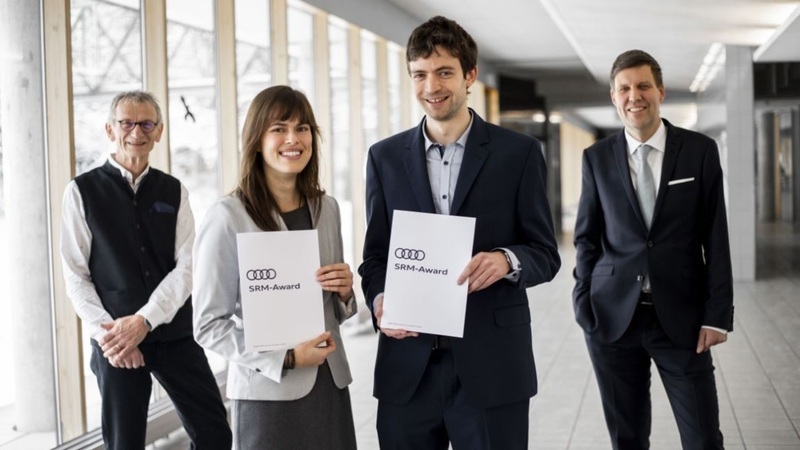 Rüdiger Recknagel, Chief Executive of the Audi Environmental Foundation, (right) and Dean Michael Suda, TUMs Dean of Academic Affairs for Sustainable Resource Management, (left) congratulate the two winners Julia Möbius and Sebastian Heinz. INGOLSTADT, 6-Feb-2019 — /EuropaWire/ — The Audi Environmental Foundation recognised two master’s theses in the Sustainable Resource Management course of study. The 8th SRM Award went to Julia Möbius and Sebastian Heinz of Technical University of Munich. Each of the winners received 1,500 euros prize money. Julia Möbius’ master’s thesis analyzed how young people regard and use the Berlin city forest. Julia interviewed 800 Berlin residents aged between 14 and 25. The result unveiled that they hardly discovered the forest as a recreational area for themselves. Thus, creating a comprehensive basis for planning future design concepts for forest areas. Sebastian Heinz’s thesis dealt with the socio-economic consequences of climate change and the associated uncertain environmental conditions. Sebastian conducted an economic experiment with students and farmers in Hangzhou, China. How social dilemmas affect people living in river basins. His research showed that fairness and trust contribute to the successful organization of unequally distributed access to water.